The second World Pediatric Project scoliosis mission for 2017 took place last week at the Milton Cato Memorial Hospital in Kingstown and, as is typically the case, Trinity students were right there with the visiting team. Over sixty children were seen, nine of which ultimately had complex surgical procedures performed by the visiting team comprised of pediatric orthopedic surgeon Dr. Robert Tuten; Dr. Mike Estes, pediatric anesthesiologist; Dr. Joanna Horstmann, pediatric orthopedic surgeon; Erin Rose, neurophysiologist; Cathy Rosenbaum and Mary 'Debbie' Walton, both OR nurses. 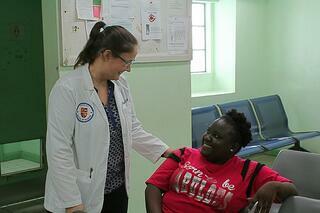 Trinity students were on hand for eight spinal fusions and a hard ring adjustment from a prior procedure. Five of the families were flown in on a private charter from hurricane ravaged Dominica to the stability and care of St. Vincent. Trinity students David Eapen and Robin Coffey were active participants in clinic day and offered some insight on their perspective as medical students. David Eapen explained, “I feel that the information presented to us in the classroom on scoliosis was excellent, as was the additional preparation for USMLE-Step-1 the school provides, so I felt pretty comfortable with what I understood going into the day, but I learned a great deal more once I got into the WPP mission itself.” Working with Dr. Tuten and the other professionals, Trinity students were able to pick up great additional clinical insight, not only on the standard workup for scoliosis patients but also on how people from all over the community in St. Vincent as well as St. Lucia and other Caribbean islands were able to utilize the mission as a way to improve the quality of their lives. This "global" perspective on the continuum of care and its impact on a community is a fantastic quality for a future physician, and at Trinity, we're always grateful not just for the great work WPP does, but that they so consistently offer this perspective to our students. Trinity student Robin Coffey agreed, “We’ve spent a lot of time getting a deep understanding of imaging and we were able to utilize that knowledge here. We’ve been able to see a lot of the clinical presentations that we learned in class so, coming here and actually applying it built the picture out and made it a real experience.” She noted that the specialists were very open to their questions, filling in some gaps and giving a bigger picture of start-to-finish treatments especially in the situation where patients had to travel far. Additional mid-week surgical procedures were further observed by Coffey and she was joined by Trinity student Kenneth Brand. Both were careful to look for the connection between what was learned in the formal class setting; what was done during clinic day; and the remedies applied during surgery. 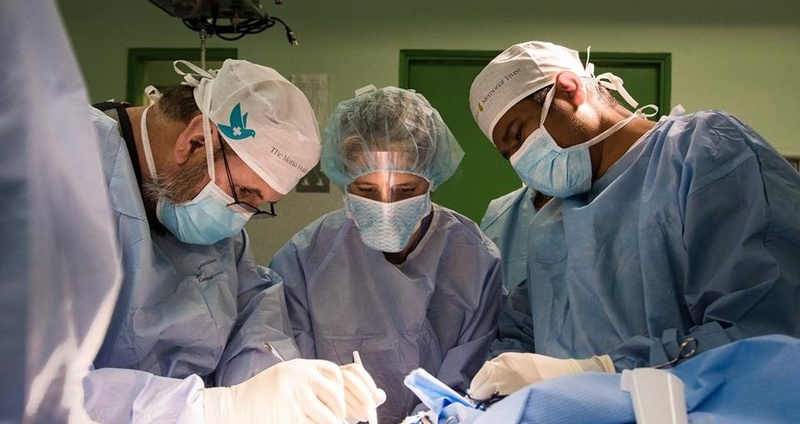 In outlining her experience of observing a spinal fusion operation, Robin said, “We definitely saw the connection. It was really neat to see the screening clinic that we did, and then coming to the surgery. The view was good and we could see how they put the screws in, how they deploy and align the rods, etc. I had a pretty good view of when they bent that first one. It was incredible seeing the spine align. I didn’t think that the alignment would be so immediate. That patient had a right side higher than the left as they made the incision; but as they closed the incision, both sides were level. It was a drastic difference!” She was incredibly appreciative of how open to questions and willing to provide guidance and insight that the physicians, anesthesiologists, and instrument rep were in explaining their perspective and their role in the surgeries. “They actually moved us around in the room so that we could get different perspectives and gave us context for each circumstance,” she said. Kenneth Brand, who did not attend clinic day, made his connection differently. “In my first I learned about the structural anatomy,” he said, “then in pharmacology I got to learn more about medicinal intervention and care, including anesthesia. 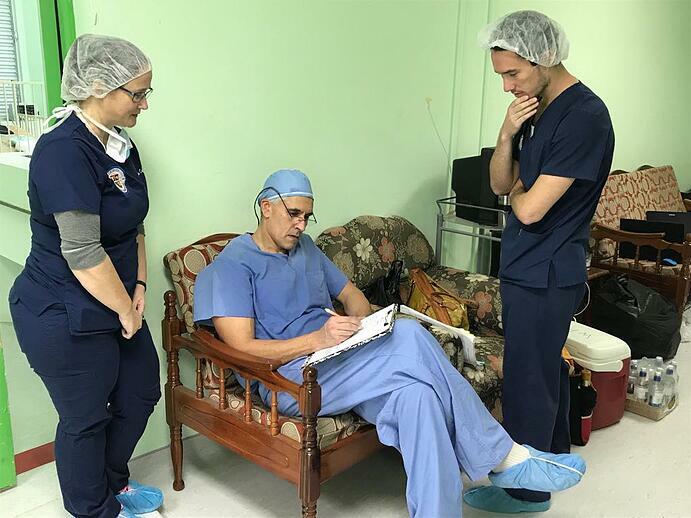 Seeing that process here, with doctors so kind and open to questions and willing to teach was fantastic.” He added that seeing the multidisciplinary team in action serving a greater whole was a great experience as well. As is typically the case, the Trinity students were adamant that the experience was as valuable as it was unforgettable. Coffey noted, "Experience like this, it takes you outside of that to see that you have to make adjustments in real life. People are bigger than the words on the page, bigger than the answers on a test.” Kenneth admitted that he was “blown away” by the procedures of the surgeries and felt that his experience was extremely helpful for understanding application of concepts he'd been taught, that his understanding deepened beyond his expectations. This particular scoliosis mission of the World Pediatric Project was a week well spent for the students of Trinity School of Medicine. 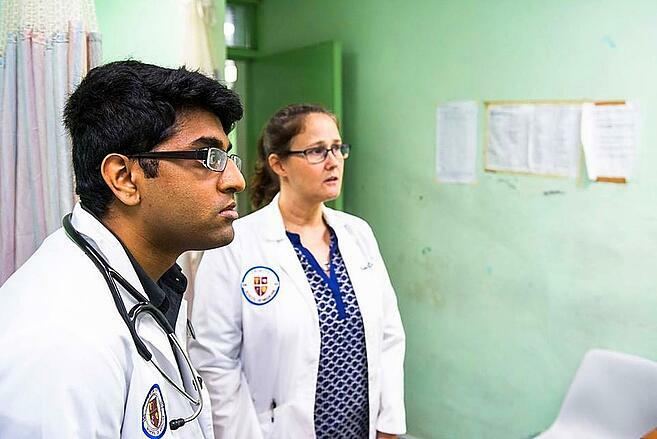 Experiences like these continue to stimulate a desire among the future physicians to serve as specialists in similar organizations if the opportunity arises, in an effort to give back to communities like St. Vincent and for continued learning and practice.